ON THE MENU: Lido chef Jacob Moss, a local wine aficionado, presents his apple and chorizo stuffed sole with braised kale, celery root latke, and apple cider beurre blanc. A visit to Lido at the Dolphin Bay Resort offers everything you’d expect in a fine dining experience. 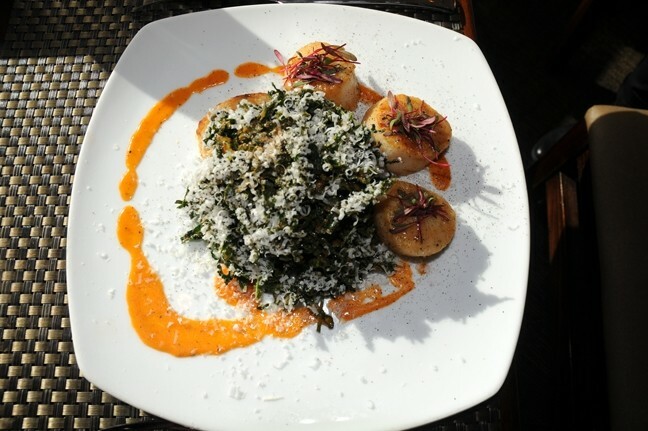 The foods are made from scratch by creative chefs who are passionate about cooking. From the front desk to the wait staff and managers, you’ll find skillful, friendly staff members who will see to your every need. The perfectly balanced wine list offers every wine varietal you can imagine, each one chosen to complement the delicious cuisine. There’s courteous valet parking, and patio dining beside the Pacific Ocean with views that are both serene and spectacular. With all of that said, there are many people who just automatically think they can’t afford to eat there. Well, I’m here to say, think again. There is something delightful for every appetite at Lido even those working on a tight budget. 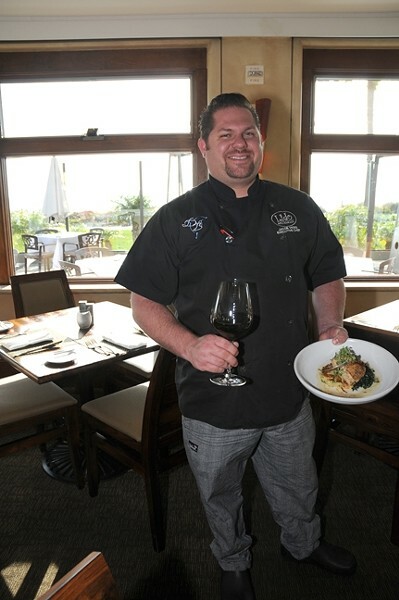 This fine restaurant at the Dolphin Bay resort features two executive chefs, Jacob Moss and Maegen Loring, and both have years of experience in San Luis Obispo County. Their fine menus and their reputations regularly pull in many loyal fans. Yet whenever I’m out and about, I still hear locals say they can’t afford to dine there. When someone says that to me, I know intuitively that they haven’t visited the restaurant, nor have they seen the menus. I do tell them that they are missing out on a fine experience that doesn’t have to cost a fortune. In a recent conversation with chef Jacob Moss, he explained that he strives to offer a balanced menu, not just high-end foods at prohibitive prices. FOR FOOD'S SAKE: Chef Jacob Moss' shaved kale and seared day boat scallops over garlic toast with grana padano and tomato vinaigrette. No matter how many years of experience a chef or any other artist has, there’s always something new to learn. After visiting twice to share the dining event with my husband Dan Hardesty, we taste tested multiple dishes from the new menus. I must say these chefs have provided some delightful new choices at every price range. That promises a reservation you won’t regret making. In fact, Lido has long been a destination for famous visitors. I was standing on the waiters’ side of the bar when I spotted David Carradine on the other side. He grinned at my surprised look when I realized it was him. Chef Evan Treadwell, who opened Lido but left three years ago, laughed and said, “You should have talked to him, he’s very friendly.” He proudly told me that he has cooking for Johnny Depp when he was filming Pirates of the Caribbean, and for Barbara Fairchild, editor-in-chief of Bon Appetit magazine, who vacationed at Dolphin Bay annually with her sisters. Lido is a great spot for people watching. Some of my faves on the lunch menu included tender and sweet Mongolian style baby back ribs (five generously-sized ribs) topped with chopped cashews ($16), seared day boat scallops with shaved kale with grana padano cheese atop garlic toast with tomato vinaigrette ($18), and the generous prawn rice bowl with excellently seasoned jumbo prawns and grilled asparagus over wild rice ($15). 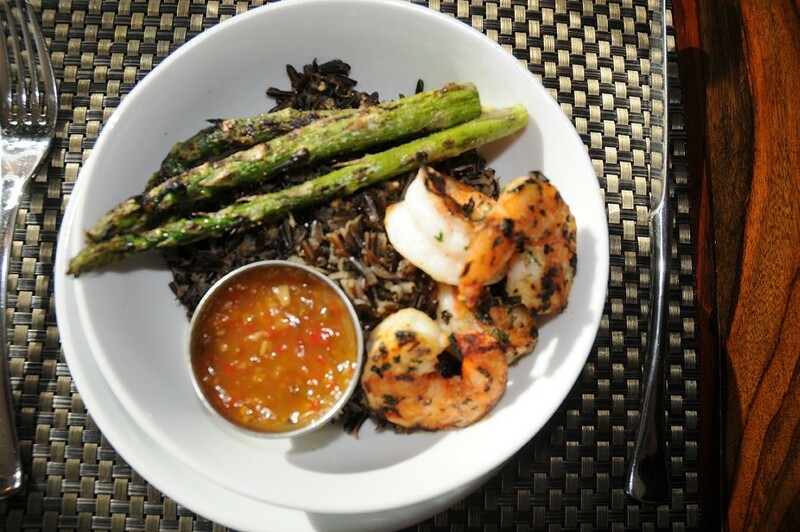 LOOKIN’ GOOD: The prawn rice bowl with sauteed jumbo prawns and grilled asparagus over wild rice. The entrées range from $20 for tagliatelle pasta in pistachio cream sauce to $45 for cocoa-crusted filet mignon with chili butter sauce, roasted peppers and smashed plantains. I adored his apple and chorizo stuffed sole with braised kale, celery root latke, and apple cider beurre blanc ($29), which would be enough on its own to satisfy my hunger. Executive chef Maegen Loring is the creative genius behind the desserts, which always feature a theme, like this year’s rock ’n’ roll sweet creations. My favorite, being a dark-chocolate fanatic, is “Stairway to Heaven” with a hot chocolate drink, chai-caramel ice cream over chocolate cookie sprinkles, and a chocolate wrapped tower filled with awesome chocolate mousse with a chocolate sponge cake bottom ($12 and well worth it!). Dinner wouldn’t be complete without the perfect wine selection, just ask sommelier/food and wine director Todd Brown, the go-to-man for the finest selection that’s within your budget. That’s the attitude both Moss and Loring live by, which is precisely why dining at Lido is worth the money for the experience even if you choose it only for special occasions.